Graphite diffusing from cast iron melts rising to the top of the melt. In metallographic specimen floating graphite is very clearly identifiable even with low degree of magnification. 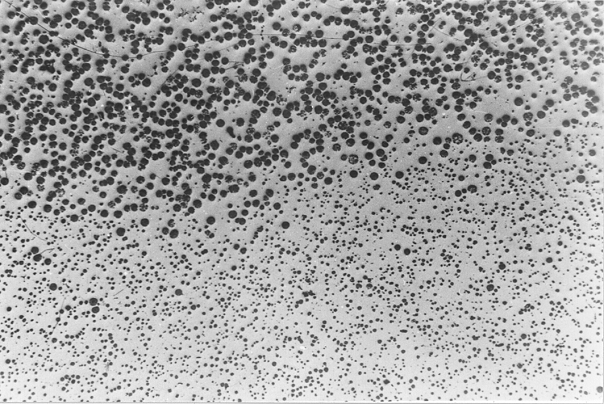 At broken or machined surfaces, the diffused and floated spherolites can be identified as dark spots even with the unaided eye (Figures 1 to 3). The defect is predominantly encountered in heavy castings made of nodular graphite cast iron, preferably in the upper section of the part but also with medium wall thicknesses below cores. 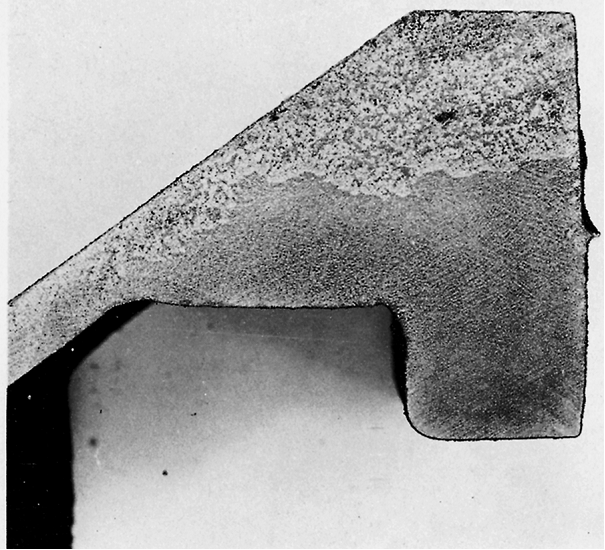 This defect can be frequently observed in hypereutectic iron composition and castings with a high modulus (volume/surface ratio, see Casting modulus). Graphite flotation must not be mistaken for kish graphite (q. v.) occurring in flake graphite cast iron. 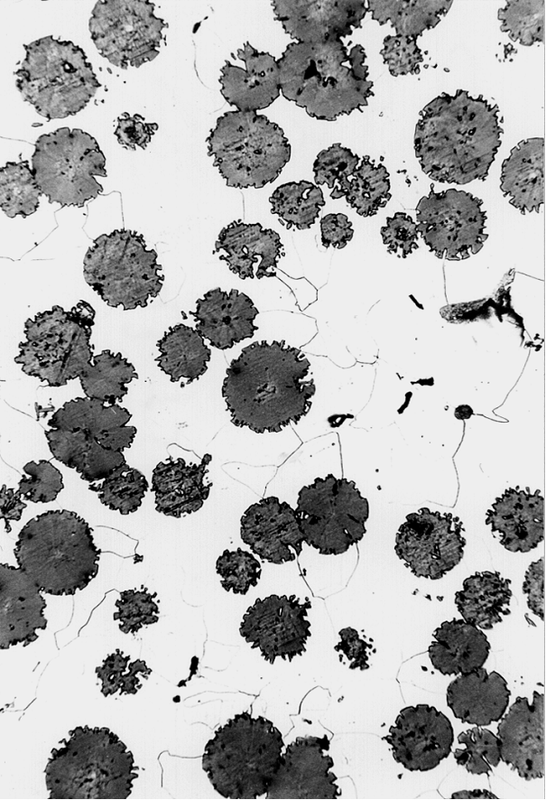 Flotation of graphite influences expansion and contraction of the cast iron during eutecticsolidification and thus also interferes with seal feeding. 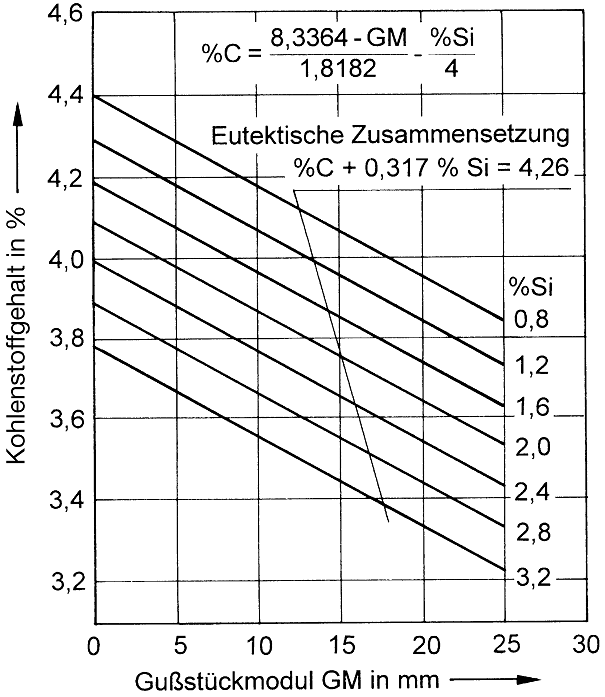 Irregular distribution of the graphite results in inconsistent properties throughout the casting. The densiti difference between liquid iron and graphite is around 4.8 g/cm3. This means that the large spherolites common in hypereutectic iron are subjected to considerable buoyancy. Moreover, the hypereutectically diffused primary graphite spherolites have large, furrowed surfaces which adds to the buoyancy effect. The flotation rate depends on the size of the spherolites, the flotation distance on the travel speed and the time available for flotation, and time in turn is a function of wall thickness. In thick-walled castings made of hypereutectic nodular graphite cast iron large spherolites are formed which have plenty of time for flotation due to the long solidification periods. This means that not only some but all primary graphite spherolites are able to float up until they reach the casting surface or the region underneath a core. 2. For obtaining great spherolite density and small spherolite size, performance of primary inoculation subsequent to magnesium treatment and secondary inoculation shortly before or during the casting process is mandatory. 3. Adjusting the casting temperature to as low a value as possible and thus ensuring fastest possible solidification. 4. Ensure fast casting and rapid cooling subsequent to magnesium treatment.